What's in It for Type 2? Sam was gaining weight and he knew why. Ever since his doctor started him on a diabetes medicine that might cause hypoglycemia, he frequently felt hungry and a bit shaky, especially late at night, and he realized he felt better after having a little snack. In fact, most nights he found himself getting up for a snack as many as four times after going to bed. He was convinced that he was genuinely hungry and that his blood glucose levels were low at those times. However, he wasn’t checking his blood glucose level with his meter when the shaky, hungry feeling hit, nor did he have any plans to start. After all, he thought he knew what he had to do to feel better: eat! But his new nighttime snacking routine was leading to other problems: He was tired and irritable during the day and had trouble focusing at work. And at his next doctor appointment, his weight had risen to 225 pounds, which, on his 5’8″ frame, classified him as mildly obese. At his doctor’s prodding, Sam made an appointment to speak with a diabetes educator. She explained to him that he could probably resolve his perceived hunger and shakiness during the night by monitoring his blood glucose levels at specific times. Reluctantly, Sam agreed to check his blood glucose with his meter before going to bed and again when he woke up in the morning. He was shocked by the results: His bedtime numbers were in the 160s (mg/dl), and his fasting numbers before breakfast were in the 130s. Based on how he was feeling, he had expected to see really low numbers, in the 50s and 60s! The next step was to check his blood glucose during the night when he woke up hungry. He agreed that he wouldn’t eat anything unless his numbers were below 90 mg/dl and, to his surprise, they never were. After reviewing all of Sam’s monitoring results with him, the diabetes educator assured him that he was not experiencing low blood glucose (hypoglycemia) during the night. Sam was genuinely relieved. He admitted that because he lived alone, he was fearful of feeling ill during the night and not being able to get help. He realized that he had convinced himself that he was hungry so that he would eat, and this would keep his blood glucose levels from dropping too low during the night. Monitoring his blood glucose at various times and seeing his numbers for himself convinced him that he did not need his multiple nighttime snacks after all. What about you? 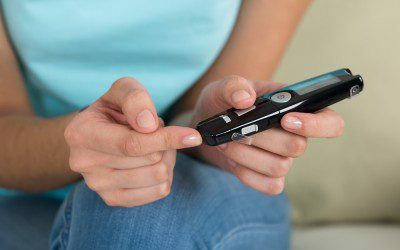 Could regular blood glucose monitoring help you resolve a problem you may be having with your diabetes management? Regular monitoring may reveal patterns in your daily blood glucose levels. For example, you may see that you are consistently low at the same time every day. This may be caused by exercising at a particular time or by having too much medicine acting in your system at that time. Seeing patterns in your blood glucose levels helps to “connect the dots” between personal choices or situations and the effect they have on your blood glucose control. The patterns that show up in your monitoring records also allow your doctor to see how your medicines are working and whether changes need to be made. Learning to identify patterns in your blood glucose levels and how to respond to them helps you feel confident that you are doing your best to keep your blood glucose under control. To monitor your blood glucose levels, you need a blood glucose meter and a supply of the test strips that are made for your particular brand of meter. There are many brands of meters to choose from. You’ll find them in pharmacies, discount department stores, and perhaps even in your doctor’s office. All meters are small, lightweight, and easily portable. Some have special features such as a large number display that is easier for some people to read, large buttons that may be easier to press, rubber grips to make the meter easier to hold, or rubber feet to keep the meter stable on a tabletop. “Talking” meters are also available for people with visual impairment. You may want to speak with your doctor or diabetes educator about which model would be best for you. Some insurance policies cover part of the cost of a meter, test strips, and other self-monitoring supplies such as a lancing device, lancets, and control solution to periodically test the meter itself. Call the member services number on your insurance card to ask about which diabetes supplies your insurance covers. All blood glucose meters measure the concentration of glucose in your blood at the moment of monitoring. Results appear within roughly 5 to 15 seconds, depending on the meter. Most meters have the capacity to store 50–3,000 results in memory, and many provide weekly or monthly averages of your results. While the meter memory is helpful, many diabetes experts recommend keeping a written record of your results. Your meter may have come with a logbook you can fill out, and you can likely get replacements from your meter company as you fill the books up. You can also download record-keeping sheets from such websites as www.onetouchdiabetes.com/logbook. By seeing all of your numbers on one page for, say, a week or a month, it is easier for you to see trends in your blood glucose levels. For instance, you may notice that your numbers are unusually high after dinner on Fridays when you go out to eat with friends, or that your numbers are particularly low before lunch on the mornings when you attend a gym class. Patterns such as these allow you to alter your daily routine or your diabetes regimen so that you stay in your target blood glucose range as much as possible. Seeing your monitoring results is one way your body “talks” to you about what is going on inside based what you are doing outside. All blood glucose meters come with user-friendly, step-by-step instructions for performing a blood glucose check. All require a small blood sample from the fingertip or, for some meters, an “alternate” site such as the forearm, upper arm, palm, the base of the thumb, thigh, calf, or abdomen. People who have very sensitive or calloused fingertips may prefer using a meter that accepts alternate-site samples. Blood glucose readings from alternate sites may differ from fingertip readings, however, if the blood glucose level is changing rapidly (rising or falling) at the time of monitoring. Your diabetes educator can advise you on whether you are a good candidate for alternate site testing and, if so, when to use these sites. To get as much information as possible from monitoring, it is important to know when to check your blood glucose levels. Your doctor or diabetes educator will help you determine the best schedule for you based on your lifestyle, diabetes medicines, exercise, and daily activities. Most likely you will be advised to check a minimum of two times a day if you do not take insulin and at least four times a day if you do. Commonly suggested times to check are before and two hours after meals and at bedtime. Checking before and after meals helps you see how your food choices and any insulin or other diabetes medicines you take before meals are affecting your blood glucose level. Checking at bedtime can help you avoid hypoglycemia during the night by alerting you to a lower-than-recommended blood glucose level. You may need to monitor more frequently if you think you are experiencing low blood glucose, if you are sick or under a lot of stress, or if your regular daily routine changes. It may also be necessary to check your blood glucose level before driving or to pull over and check while you are driving if you think your blood glucose may be low. You want to have a clear idea of what your blood glucose goals are. The American Diabetes Association has established general blood glucose goals for most adults with diabetes: An HbA1c level of less than 7%, premeal blood glucose levels of 80–130, and peak postmeal levels below 180. However, these goals may not be right for everyone. Personal characteristics such as advanced age or the presence of certain diabetes complications may mean that different goals might be better for you. Speak with your doctor or educator about what goals are right for you. Not all of your monitoring results will be within the desired range every time you check. Rather than get discouraged by this, try to think of why your blood glucose might be higher or lower than desired (or expected) and what you might do differently next time. For example, a high number after a meal might prompt a thought such as, “I think my number after dinner tonight went up so high because I ate too much bread. I’ll cut back to one slice instead of two tomorrow night and see what happens.” A low number before dinner might lead to: “Now that I see how low my numbers are before dinner, I’m going to have to start having a mid-afternoon snack to keep myself from dropping too low on my drive home.” When you try something different in response to out-of-range numbers, monitor again afterward to see if what you tried changed your results. There may be times when you become frustrated with your body because you see different results after eating the same meal, taking the same dose of medicine, and engaging in the same activities as you usually do. Why does this happen? We don’t know for sure. The body doesn’t always perform in exactly the same way every day. Also, the blood glucose meters used for home testing are not 100% accurate, so you may see some variation in your readings because of that, as well. For these reasons, it is best to look for trends or patterns in your blood glucose numbers rather than focus on isolated numbers. If your results are somewhat different but still in your target range, you need not be concerned. However, if your results are significantly different under the same conditions, check your monitoring technique. (See “Good Blood Glucose Monitoring Technique” for details.) If you find no problems with your method of monitoring, and there are no unusual stresses on your body that might affect your results (such as sickness or lack of sleep), discuss your varying results with your diabetes educator. It clarifies the effect of your food choices and/or portions on your blood glucose level. It helps identify hypoglycemia (low blood glucose). Frequent monitoring can also help you manage hypoglycemia unawareness (the inability to sense low blood glucose), if you have it. It guides your decision-making about adjusting your food intake and/or medication for exercise, travel, changing jobs, moving, starting a new school routine, or other schedule changes. Monitoring allows you to see patterns in your blood glucose levels, which can help you and your health-care provider better match the timing and dose of your diabetes medicines with your eating and exercise patterns. Monitoring provides valuable information during periods of illness, helping you to adjust your diabetes regimen, if necessary. Ultimately, blood glucose self-monitoring offers you an opportunity to take an active role in managing your diabetes. It provides you with the most immediate feedback you can get about how your body responds to actions you take deliberately, as well as to unexpected occurrences you didn’t plan. It allows you to have an ongoing “conversation” with your body every time you use your meter. The information you gather through monitoring your blood glucose can help you build confidence in your ability to manage your diabetes. A tiny drop of blood a few times a day is a small price to pay for all these benefits — don’t you think? Sam thinks so. In nine months, he lost 25 pounds, lowered his A1C to 5.9%, maintained a blood pressure reading of 118/70 mm Hg — all without any medication increases. He saw improvement in a balance problem he had had when walking that was due, at least in part, to his weight loss. What Makes Blood Glucose Go Up or Down? Johanna Burani is a registered dietitian and certified diabetes educator working in Wayne, New Jersey. She is the author of Good Carbs, Bad Carbs (Marlowe & Company, 2002) and several other books highlighting the benefits of low-glycemic-index meal planning.